Notes: * The energy efficiency targets for 2020 and 2030 are defined as absolute targets, set at 20 % and 32.5 % below the level in primary and final energy consumption projected for 2020 and 2030 in the European Commission's 2007 Energy Baseline Scenario. 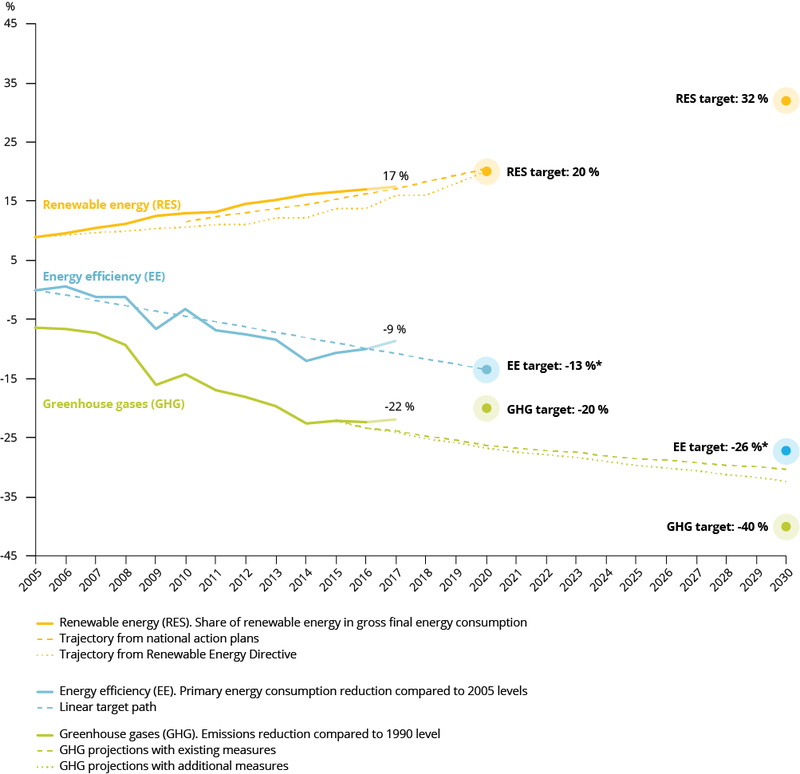 In this figure, the target is expressed as a relative change compared with 2005 levels of primary energy consumption in the EU to show the required reduction in primary energy consumption over time. The year 2005 was chosen because it is used as a base year for GHG emissions (in the EU ETS and under the Effort Sharing Decision (ESD)) and renewable energy targets; this base year is not set in the energy efficiency legislation. It also corresponds to a peak in energy consumption in the EU. The 'with existing measures' (WEM) scenario reflects existing and adopted policies and measures, whereas the 'with additional measures' (WAM) scenario considers the additional effects of planned measures reported by Member States. Sources: EC, 2013a, 2007; EEA, 2018a, 2018b, 2018c, 2018d, 2018e, 2018f, 2011; EU, 2012, 2009a; Eurostat, 2018a, 2018b, 2018c. For references, please go to https://www.eea.europa.eu/highlights/rising-energy-consumption-slows-eu or scan the QR code.